One of my favourite beers styles is the American IPA with lots of citrusy/piney/fruity/resiny hop flavour. I've been playing around for some time with various hop combinations trying to hone in on one combination that I can call my house "Electric IPA" the same way I have my house "Electric Pale Ale" (a beer that I've brewed numerous times and always like to have on tap). This recipe purposely keeps the standard 60 minute bittering hops somewhat restrained for a total of 37 IBUs at the 60 minute mark. The rest of the bitterness comes from late additions. Most of the flavour hops are done at 5 minutes before flame-out to give the beer a massive hop flavour. The beer is then also heavily dry-hopped for additional aroma. This is way I like my American IPAs: Bitter enough to be an IPA but not over the top mouth-puckering, with enormous hop flavour/aroma. Because of the higher gravity I'm mashing fairly low (150F) to produce a more fermentable wort to ultimately produce a drier beer. The beer fermented out pretty quick. Dropped from 1.065 to 1.015 in 5 days at which point dry hops were added (that was 5 days ago). I tasted it today (at 1.013 which is my expected final gravity) and this one's going to be great! I really like this hop combination. I'm going to leave it for another 3-4 days on the dry hops then rack it to 5 gallon carboys (brite tanks) to clear with some gelatine for a few days and then keg and placed in the serving freezer under C02 pressure to carb. I've now kegged it.... had a taste (ok, a couple of pints) while kegging and it's exactly where I want it to be. Bitterness at the right level, lots of hop flavour/aroma. It's in the cold room at 52F right now under gas to carbonate.... waiting for a spot in the 9 keg keezer to free up so that I can put it on tap. Ok, I've been drinking this beer now for the last couple of weeks and I think found my new "house" AIPA. Tons of hop flavour/aroma without over the top bitterness. Of course, everyone will have different favourite hops but the ones I used here worked really well (IMHO). If anyone brews it let me know what you think. It sounds good. Did you use pellets for dry hopping? Yup! Whole hops are fine too. I use pellets 99% of the time over whole hops because they store better (less room) and stay fresh longer. Utilization is slightly higher too (you get slightly more out of them per weight as compared to whole hops). This was my first brew with the new system. I ended with a higher og due to an extended boil(1st time running in circles kinda thing:))but everything went really well. I absolutley loved the ease of operation and while I thought the cleanup would be a hassle, it was a cinch! Now, the beer, hands down the best beer I have ever brewed! Even though my ABV is higher(too bad) and I ended with less than 10 gallons(now that is sad) this beer is just downright outstanding. Great job Kal on the recipe and thank you so much for designing the system. I currently have your SN Torpedo in secondary, can't wait to try it! Excellent Doug! Glad to hear that you like it and that the brew day went well. Hey I brew it 4 weeks ago and I have to say that this is honestly one of the best Am.IPA I've tasted. I Dry Hop it 4 days during my sec fermentation (cold crash) and it didn't get too grassy. Nothing to change, this is a great brew. I'm glad you're enjoying it! It uses some of my favourite hops that I find work really well together. It's been a while since I've brewed it myself - time to line up another batch I think! 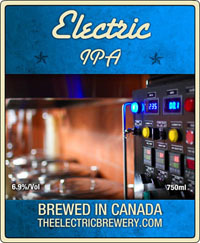 I kicked off our new system with your Electric IPA. It is still in the primary but I have a few (stupid) questions for you. Do you have a separate ferm chamber that you use to cold crash? I will be bottling my first batch. If I am able to cold crash it, will there be any yeast left to carb it up after I add the priming sugar? I am pumped to sample this awesome recipe! I add gelatine at fermentation temp, wait a few days, rack to a keg, then throw the keg in my conditioning fridge at 32F, and attach the CO2 for it to carb up and mellow/condition a bit over ~2 weeks before putting it on tap. Sometimes kegs will sit for months before going on tap. Fine for many styles, but I try and not have a backlog of hop-forward beers as they don't age well. If I am able to cold crash it, will there be any yeast left to carb it up after I add the priming sugar? This is the most delicious IPA I have ever brewed... I've drank "several" pints over the last few nights, and still grin every time I put my nose in the glass. I have a Pliny clone fermenting right now, but I will likely do this up again afterwards. I will probably do a split batch with us-05 and Conan since I have some in my fridge now and am excited to try it out. Glad you enjoyed it Luke! It's a pretty "by the books" IPA grain bill with hops that I find work really well together. Having a blast brewing with this setup, Kal! This is the fifth brew day - today brewing the Electric IPA after doing the Electric Pale Ale, Janet's Brown, a somewhere else sourced stout (delicious too), and the blonde ale. Debated a couple of IPA recipes but after remembering how good the EPA and Brown were, decided to use your recipe. Thanks for a comprehensive resource from build to glass! Glad you're enjoying the setup! I shouldn't be complicated to make good repeatable beer - hopefully the setup's helping with that! Finally got a chance to brew the E-ipa. This one is stupid, good! Can't believe how well it's balanced. Hi Kal! Just to be clear in the response above you are saying that you rack from the buckets to the carboys, dryhop, and then add the gelatine and then add to a keg and carb?